When you look at your home, you might see a long list of things that need to be done, but you just don’t have the time to do it all. Especially when seasonal cleaning becomes important at various times of the year, that cleaning list can grow even longer. Choose the Cleaning Services You Need – When you hire a team for house cleaning, you get to choose the services you need. There will be the basic things, like cleaning the kitchen and bathrooms, but you may also be able to choose things like dusting, making the beds, and even help with laundry or dishes. With a customized list, house cleaning becomes easier than ever. Save Time & Money – DIY house cleaning is a major chore, but with professional house cleaners on your side you can save lots of personal time and money. House cleaning services keep your costs low because you won’t need to buy as many cleaning supplies or equipment, and the time saved could mean more money relaxing or spending time with family at the end of the day. Coordinate Your Own Schedule – Another benefit of house cleaning services includes the ability to coordinate cleaning days with your work and home-life schedule. Need cleaning on a weekday or weekend? No problem. Then you can enjoy your clean home without the inconvenience. 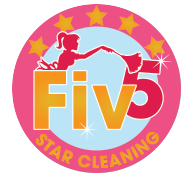 At Fiv5 Star Cleaning, we know that you want to be able to spend time at home without worrying about a long list of cleaning to-do items. Why not give us a call to see how we can customize your house cleaning services for you?